Algerian ambassador to Korea Rabah Hadid held a reception on Nov. 1, 2007 at Hotel Lotte in downtown Seoul to mark his country's 53rd National Day, which is to remember the Algerian War also known as Algerian War of Independence that took place between 1954 and 1962 and led to Algerian independence from France. More than 200 plus well-wishers attended the function which was also joined by visiting Algerian Minister for Participation and Investment Promotion Abdelhamid Temmar and his delegation members. Among those who attended the event also included Amb. Mohamed Reda Kamel El- Taify of Egypt, Amb. Vasin Teeravechyan of Kingdom of Thailand and Amb. Abdullah M. Almaainah of the United Arab Emirates, to name just a few, who had friendly chats with newly appointed chairman of Korea-Algeria Friendship Association Shin Heon-cheol during the reception. Minister of Trade Kim Jong-hoon of the Ministry of Foreign and Trade Affairs attended reception to express felicitations on the country's National Day on behalf of the Korean government. Among other well-wishers who were on the event were members of the foreign diplomatic corps accredited to Seoul, local business community leaders as well as prominent figures representing a broad spectrum of Korean society. Members of diplomatic corps and other dignitaries join a congratulatory cake-cutting ceremony. 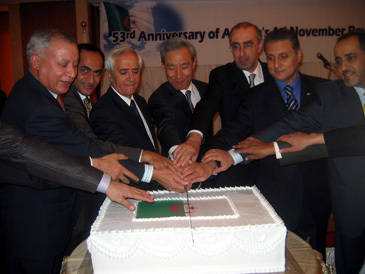 Shin Heon-cheol,chairman of Korea-Algeria Friendship Association and concurrently CEO of SK Energy Co. in a separate message, congratulated the Muslim Algerian government and nation on the National Day and wished them success and prosperity stressing closer cooperation with Algeria in commercial and industrial fields. Shin noted that bilateral cooperation projects are brisk in electronics, steel, defense, petrochemicals and construction sectors in particular, "Such cooperation could strengthen the countries' two-way trade that reached US$1 billion in the first nine months of this year, up from $500 million during the whole of 2005," Shin said. Minister Temmar accompanied by key economic officials from Algeria is on a five-day visit to Korea on a mission to strengthen economic cooperation. His trip here follows a summit between the presidents of the two countries in March, where the two sides agreed to establish a strategic partnership. Algeria is rigorously reforming its economy into a market-based one after more than three decades of socialist central planning. He told Shin that his country looks to Korea as a model of development. The presidents of Korea and Algeria in March agreed to form a strategic partnership, joining hands in almost all sectors of the economy, including policy planning. "We're sending 200 of our high cadres to be trained in this country. And the second thing is we just finished a strategy for industrial development. Obviously we gave it to our counterpart and colleagues so that they can put use on that strategy and give us their evaluation of that work," Temmar added. Amb. Vasin Teeravechyan of Kingdom of Thailand(fourth from left) poses for camera with members of KAFA including its new chairman Shin Heon-cheol(third from left). At far right is Minister Ibrahim Al Mansouri of UAE Embassy in Seoul..
Seoul and Algiers have formed a joint task force in charge of economic cooperation, and the Algerian delegation is here to meet with high-level economic policymakers and businessmen. During their stay, the Algerians will also tour some key industrial complexes related to shipbuilding and petrochemicals among others. The minister said the two sides now have a clear idea of which areas they can work on together, and that discussions are under way for five or six major business deals. "Discussions on petrochemical plant investment and wheeled armored vehicles are expected to make headway at the high-level talks planned for later in the day," said a Ministry of Commerce and Industry official without going into details. He added that the meeting in southern Seoul between Vice Commerce and Industry Minister Oh Young-ho and Algerian Minister for Business Participation and Investment Promotion Abdelhamid Temmar could open doors for South Korean companies that want to build Algeria's second highway. In a contract that may be worth $4 billion, a South Korean consortium led by Daewoo Engineering and Construction Co. has secured priority rights to build a modern city in Algeria. Meanwhile, Samsung Electronics plans to produce 550,000 home appliances for Algeria starting in April. Temmar met Shin, CEO of SK Energy and other local businessmen interested in investing in his country. Algeria, which has 123 million tons of oil reserves, may help South Korean companies gain an important base of operations in North Africa. In the meantime, South Korea and Algeria agreed in principle to waive entry visas for businesspeople visiting from each other's country, the Seoul government said on Nov. 1. The decision, reached at the third joint economic cooperation committee meeting held in downtown Seoul, will be a stopgap measure until a formal multiple visa agreement is reached, the Ministry of Foreign Affairs and Trade said.